We can probably all agree that incorporating the most natural ingredients into your skincare routine is ideal. Natural ingredients can also work to calm through their scents. This Works Stress Check line incorporates essential oils into everyday products to calm your senses and work wonders on your hair and skin. My sensitive skin has definitely improved with this system, I love it! Stress Check Breathe In | This product is a great excuse to literally stop and take a breath. Whether your day is over-whelming, work is stressful, or you just need a moment to relax, these essential oils can really help calm the senses. Key ingredients include eucalyptus, frankincense and lavender oil. Eucalyptus helps cleanse, frankincense is an antiseptic and lavender relieves tension. Stress Check Hair Elixir | With a combination of neroli, patchouli, lavender, and chamomile, this hair mist releases scent with your movements throughout the day. You get the benefit of the calming scent along with the non-greasy hydration. Simply mist on to your hair after you've styled it and go! It can also be applied to wet hair, but it is recommended that you do not comb it through to prolong its effects. Stress Check Face Oil | You may think skin oils can only be enjoyed by those with dry skin, but they are beneficial for all skin types, even oily! I've been using this oil during the day and it quickly absorbs to hydrate and soothe my sensitive skin. You can also wear this under makeup as it leaves no residue. It contains vitamin C and E, omega 3, and natural oils such as patchouli, lavender, and chamomile. My skin has felt more moisturized and has looked much less red since using this oil. It's been a lifesaver and has allowed me to use much less makeup too! Stress Check Face Mask | The face mask is definitely my favorite discovery in this line. It can be used as a mask or as an intensive overnight treatment. I've been loving using it as my nighttime moisturizer. It feels silky, hydrating, and calming which is great right before bed. My skin is smoother and I've definitely noticed a reduction in redness when I wake up in the morning. Definitely a favorite for my sensitive skin! If you have any issues with skin sensitivity or redness, I highly recommend looking into this line. Using gentle, natural ingredients makes a huge difference in the health and appearance of the skin. 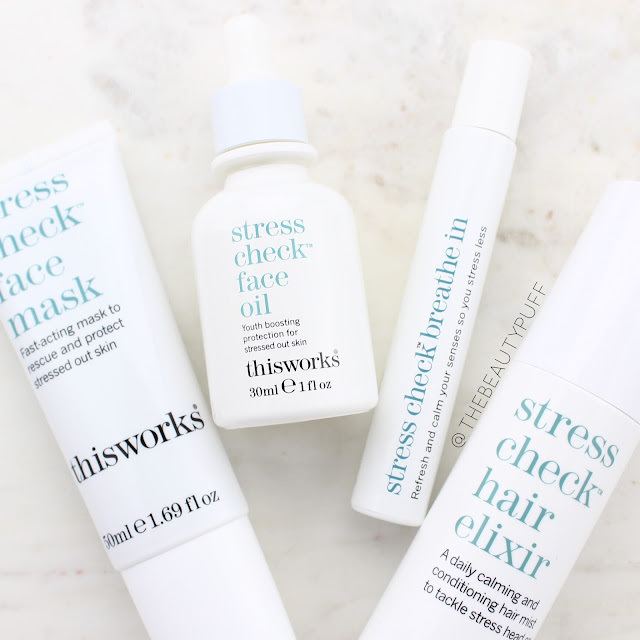 You can explore the entire Stress Check skincare line below!